AnonD-148776, 25 Mar 2014Simply, Nokia has set the benchmark in smartphone photography and other manufacturers yet to ... moreEvery company have there weakness & Strength. Nokia only good in Camera whst about other aspects. And your beloved company is right now light years behind Samsung, HTC, Sony and Apple. So Camera is not everything. Too much wasted space on the bottom of this phone. Ugly. 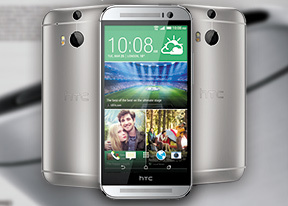 The HTC logo on the front is really unnecessary, as this has wasted potential screen size. Otherwise, a amazing phone. Better than the Galaxy S5. Any word on whether they have addressed the lack of support for Certificate Authentication for Exchange Active Sync which made the HTC One unusable with many corporates without the addition of third party mail clients? HTC missed a trick here, they could have easily gone with a conventional 8+8MP=16MP camera & could have held the bragging rights. To be honest ultra-pixel is really a marketing gimmick. I own a htc one, images @ nite r so bad u will end up assuming its been loaded wit noise filter on purpose. This phone is just incredible. Mesmerising industrial design and ergonomics, simplest and good looking UI, greatest sound quality ever from a smart phone, intuitive and great camera effects .Camera quality is good enough (if the purpose of photos taken is only to share in social media and in local phone viewer). Since day one i have this gorgous smartphone. And when you have it in your hands, you feel the solid body damn. You think this cant break thats the feeling wehn you have this phone in your hands. I dont have any issues with shooting photos on 4MP ultrapixel camera. I like the quality. If i want to shoot quality fotos il will buy an real camera. So people who are having down-syndrom for the camera i cant understand you. AnonD-77500, 04 Apr 2014The frequency of the 4G network in Brazil is 2,600 mghtz, htc one American work m8?????? Widget images for mail, messages, phone and camera could do with a refresh. Android could really do with more stylish icons for these as they are really look dated like something of the 80's or entry level design that hasn't matured. Sony do a good job of theirs but stock Android visuals for those are . . boring against new devices. Giddy up.. have fun with your designs. The frequency of the 4G network in Brazil is 2,600 mghtz, htc one American work m8? Only downside so far is - be careful when connecting to the charger! Been living with mine and got two, albeit relatively minor scratches, on the edges. Only good thing is that I am the only one who will notice! I hate scratches on my phones! Extra careful from now on! !